Acne vulgaris (meaning 'common acne') is an inflammatory condition of the skin, which from the external perspective is triggered by changes in the skin structures of the hair follicle and the oil (sebaceous) gland. Acne Vulgaris is the general name for the most common and conventions types of acne such as pimples, spots or zits. As with most acne types, acne vulgaris is most common during puberty but can certainly manifest during adult life, as some individuals will continue to suffer from acne decades later. The first and most important step in dealing with acne vulgaris, is to know and focus your efforts on the true cause of acne. 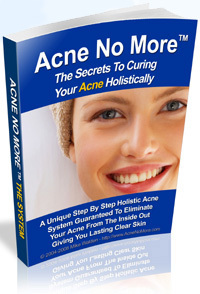 Contrary what triggers the external symptoms of acne (the excessive production of oils from the sebaceous glands accompanied with naturally occurring dead skin cells that block the hair follicle, create the prefect environment for acne bacteria overgrowth and this triggers inflammation and other acne symptoms), the internal cause of acne is rooted in a much deeper level. By tackling the internal cause of acne, you can save yourself years of agony and disappointment and thousands of dollars otherwise spent on acne medications that either don't work or work short term. Another negative aspect of using conventional acne medications to treat acne vulgaris is the unwanted side effects known to be the result of long-term use of prescription medications. Aside from that, acne medications can make your acne vulgaris condition worse in the long run. Acne vulgaris, if treated improperly can cause mild to severe acne scars, which can have their psychological effect on one's self-esteem. The only way, one can overcome their acne vulgaris condition is by tackling the internal problems that's causing acne, following the holistic all natural approach. Read the following articles to better understand how to cure and prevent acne vulgaris.